Newly renovated, spring 2014, home which includes a new kitchen, new ipe pool deck and cable rail, new large sliding glass door, newly renovated bathrooms and tiled laundry room. Our beautiful 4 bedroom home at Kiawah Island has its own private, heated pool. 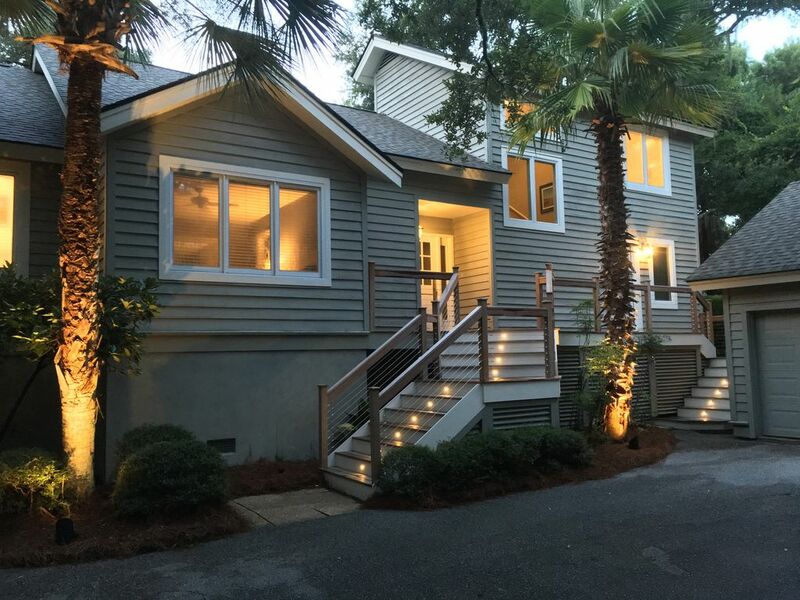 The home is located at 149 Treeduck Court and is the perfect rental for one or more families to come and relax in the beautiful setting of Kiawah Island. The home offers bright, spacious rooms beautifully decorated with new furniture, including a 55' plasma tv and wireless internet service. Situated in a tranquil cul-de-sac in the gated Vanderhorst portion of the island, it is only a short five minute walk to Kiawah Island's pristine ten-mile beach. The home has hardwood floors throughout. The first floor features three bedrooms (one king, one queen, one twin over full bunk plus one full with trundle) each with ample custom built closet space and their own private full baths. The first floor also features an open floor plan ideal for family and friends gatherings. The kitchen includes a central island, a large laundry/mud room, and access to the screened porch and deck. The large living and dining areas open out to the back deck and pool. The second floor features the secluded master bedroom and bath. The master bedroom features a king-size bed, tray ceiling, sitting area, walk-in custom closet, a dual vanity sink, and a private deck overlooking the pool. A beautiful large heated pool is located on a new over-sized ipe deck. Furnishings on the deck include abundant teak furniture for entertaining, dining and lounging poolside. A screened porch overlooks the pool. The pool is available from March 20th to October 30th. Please inquire about use off-season. The home has a FOUR STAR rating from a local rental agency. A vacation concierge will be available on the island for your convenience. We have been vacationing on Kiawah since 2000. We have tried to make our home a very pleasant and relaxing vacation destination. From the pool, to the large pantry, to new kitchen, to the custom built closets, we have added the features of vacationing that we have enjoyed over the years. Please enjoy our house. We loved our stay and the house was perfect for a family. Each bedroom has a private bath and a great family room to hang out. Perfect pool and screened in porch and nice space to grill. The house is in a beautiful neighborhood and a short walk to the beach. We enjoyed our stay. The house was a great layout and the heated pool was the perfect thing since the ocean was cold for the kids to get in. Highly recommend bikes for riding as well as to make trips to the beach easier. We had a great experience and would rent again. Great house in a great location - a perfect match for our family!!!! We had an amazing stay at this property. The house was clean, well appointed and the amenities and location were great. The pool was the perfect place to relax for those that didn’t want to go to ththe beach. For those wanting beach time, it’s a very nice and easy walk from the house. Top notch on all dimensions! We really enjoyed our week at this property. The owners were very nice and helpful and the property management company was very organized and responsive to our questions. I would recommend this without hesitation to anyone visiting Kiawah. Also, easy to get to the beach from here on bikes - made it there everyday! Our family of 4 (2 adults, 2 teens) enjoyed our stay in this home. It was probably one of the most relaxing vacations we have ever had. We loved hanging out at the quiet pool with its private wooded backyard. Getting to the beach was very quick and easy using the beach cart provided or riding our bikes. When we look for a house to rent, we look for comfortable, nice furnishings and this house met that criteria. The living room set up was great with large, soft couches, swivel chairs, and a large TV. We rented movies every night from Red Box at Harris Teeter. Kitchen was well stocked although we ate dinner out most nights. All of the bedrooms were nice, comfortable beds, plenty of closet space with hangers provided. I wouldn't say that the house was "newly" renovated as the caption currently reads for the listing because it was obviously done a few years ago but it is updated and has been maintained well. There is a reason this house gets so many 5 star ratings. House was lovely, clean, and comfortable and we would definitely book again. Saturday to Saturday rentals only in peak season. Email for quote for Holidays and Marathon. **Payment by Check and eCheck accepted. Credit Cards additional 3.5% fee. **No Smoking & No Pets. **Cleaning Fees are included. **Taxes and Fees are NOT included in quote. **Optional Pool Heat Fee is NOT included. Please indicate if your are interested in heating the pool. Email for exact quote.